What was the inspiration for The Prince’s Poison Cup? My children’s stories are designed to teach significant biblical concepts using foundational biblical texts that ultimately end up as the framework of a story. The Prince’s Poison Cup refers to the cup of God’s wrath that Jesus had to drink. Through this story I am attempting to communicate the terrible price that Jesus had to pay for our redemption by being willing to drink that awful cup. This story is about Gethsemane and about the cross. What is the youngest suitable age for this story? What inspires you to write children’s stories? Ultimately, my target audience in a children’s story is the parents who are reading the stories to their children. To communicate difficult abstract concepts like imputation in The Priest with Dirty Clothes, that is, in a parable-like way, makes it easy for people to understand. The exchange of clothes as the climax in that story is a very effective image to communicate what imputation means. I have a piece of a menu from eight or nine years ago in my wallet where I wrote down 10 or 12 possible themes for children’s books. From time to time I pull it out and look at it, and when the time is right, I refer back to this list and begin to flesh out a story. I usually like to build the story on a real life situation. The Lightlings, for instance, talks about a child who is afraid of the dark and thus afraid to go to bed at night. For The Priest with Dirty Clothes, I used the example of children that come inside from playing outside in the mud and their clothes are all dirty. That becomes the springboard into the book. Children will relate to the story of The Prince’s Poison Cup because they have all tasted yucky medicine and had to learn that the bad-tasting medicine will help them to be made whole. We jump from there into the concept of being ultimately made whole. It’s easier. You can let your imagination roam completely free. Fairy tales and fantasy stories mesmerize children, like what C.S. Lewis did by telling simple stories to communicate complex truths. It’s something I like to do. Does being a grandfather give you a different perspective on childhood or children’s literature? Yes. For years prior to starting to write children’s stories I used to ad lib stories for children. When I would be around them, they would want me to make up a story on the spot. I’ve been involved with this genre for a long time. I once made up a character for the kids at our Ligonier Study Center called Willie the Wolf. During story time when they least expected it, Willie would show up and scare them. They loved it. She is based on my great-granddaughter. I try to include my grandchildren or great grandchildren in all of my stories because it has a particular significance to them. In this day and age, the need for atonement is being ridiculed widely, not just in the liberal church but in certain sectors of the evangelical community as well. People are saying that satisfaction involves God in cosmic child abuse. They ask why we can’t just rely on the love of God — that there is no need to satisfy His justice and His wrath. Through this story I want people to understand that the wrath of God is real. It was necessary to satisfy God’s righteousness in order for people to be healed. Instead of our receiving the cup of wrath, it was to be drunk by Jesus in His people’s place. That is absolutely central to the gospel. Perhaps you would like to Hear samples of R.C. 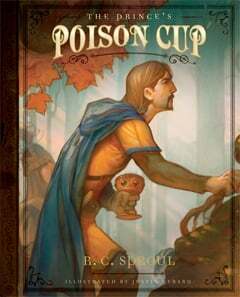 reading The Prince’s Poison Cup or Learn More About the Book.